File: Republican candidate for U.S. Senate Ted Cruz answers a question from a television reporter Tuesday, Nov. 6, 2012, in Houston. 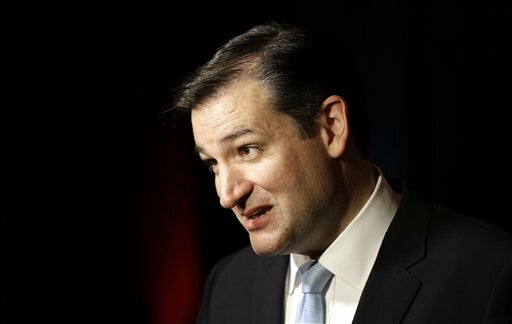 Ted Cruz may have end up being a determining factor on immigration reform. The Boston bombing is casting a long shadow over the immigration bill penned by the bipartisan Gang of Eight, but that — the idea that border procedures need to be tightened to keep out the likes of the immigrant bombers (who were 8 and 15 when they arrived here) — is the least of the bill’s problems. The first is that the only political team that needs this bill is the GOP. And because the Republicans have such a nasty recent history on immigration (self-deportation, anyone?) and are so split on the issue, the Democrats don’t really have to do much of anything to benefit. When it comes to the largest voter bloc invested in the immigration bill — Latinos — there are so many other issues that push them away from the GOP (the umpteenth attempt to repeal Obamacare, positions on education and taxes), that Democrats can just stand by and whistle. If the bill passes, it will be a victory for them and the crossover Republicans, but if it dies, it’ll be the Republicans’ fault. So no need to break a sweat. For the GOP, the immigration bill was originally the band-aid to cover up the bruising they got at the presidential polls from Latinos last November. For a minute, it looked like the very ambitious Sen. Marco Rubio (Florida) was going to be the Moses figure to deliver. You see, Rubio wants to run for president, and the best argument for his candidacy — because he has no legislative accomplishments — is that he, unlike other Republicans, will connect with the illusive Latino community. Unfortunately for him, most non-Cuban Latinos (and quite a few Cubans) despise him for his Tea Party allegiance and extreme right wing positions. The immigration bill, though not without its perils, seemed perfect for him: An opportunity to author a major piece of legislation while simultaneously neutralizing some of the antipathy toward him and the GOP among Latinos, giving him a chance to reshape the relationship in time for 2016. But a number of things have happened since November to cool the GOP on immigration reform. For starters, while Rubio —Tea Party-affiliated, conservative, Latino -- gave cover to Republicans who might want to crossover and vote for immigration reform, the rise of Sen. Ted Cruz (Texas), another 2016 presidential aspirant, gives them another kind of cover. Cruz is also Tea-Party-affiliated, also ultra-conservative, also Latino (even also Cuban), and he absolutely hates the idea of immigration reform. In other words, Cruz serves as a shield for anyone who wants to vote against it and beat accusations of racism and the like. How can it be racist, after all, if a Latino like Cruz is also against it — and not just against it but vehemently, ferociously against it? And if it makes it out, it’ll then go to the House, where opposition is even more vocal, where the GOP has control and the our lame duck president has even less influence. The sad fact is that many, if not most, of the GOP senators and reps calling for a slowed legislative process on immigration reform aren’t for immigration reform at all. What they want is to stop or dramatically slow immigration, especially from non-European countries. Cruz, in fact, goes so far as to consider undocumented immigrants subject to criminal prosecution on their status alone. And he isn’t above piling on: he authored a Supreme Court amicus brief on behalf of 10 states (Lopez v. Gonzales), urging the strictest enforcement of laws punishing those with prior felony convictions who entered the country illegally. If Cruz takes the reins on this issue from Rubio, the immigration bill is dead on arrival. And when you consider that Rubio might be the best bet for this bill, you know something has gone really, really wrong.